Two pieces of twisted steel, secured by the City of Hattiesburg, were transported from New York City to Hattiesburg and officially transferred to the University of Southern Mississippi. The artifacts are described as cut steel wall spandrel measuring 72 inches in length by 12 inches wide and 1-inch thick. Each piece weighs approximately 200 pounds. The University of Southern Mississippi established a 9/11 Sports Safety and Security Memorial at the entrance to the National Center for Spectator Sports Safety and Security (NCS4) at the Trent Lott National Center. 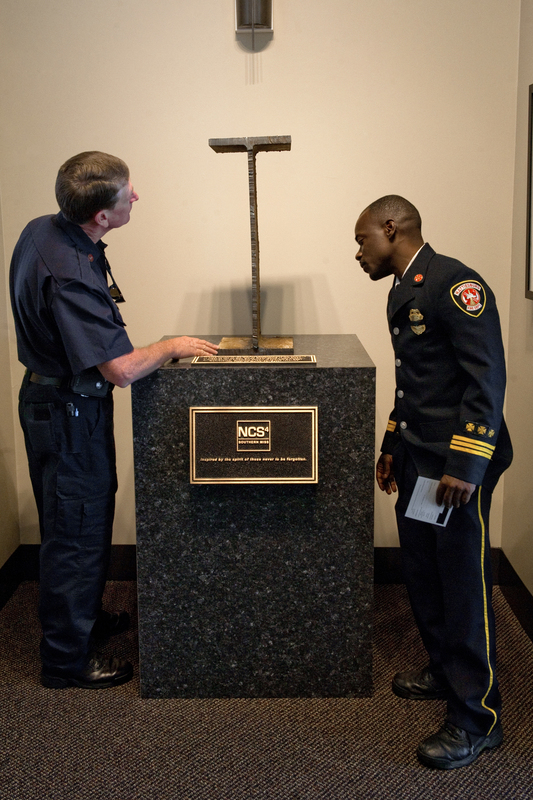 The events of 9/11 were a major factor in the creation of NCS4 and this memorial signifies the University’s commitment to the Center to provide training, professional development, academic programs, as well as research to address safety and security issues at sporting events nationwide.